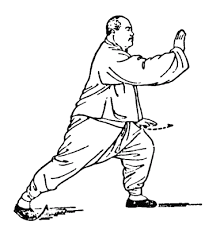 Brush knee is one of those central techniques you find in taijiquan - one of its "defining movements", if you will. Chances are that if you stumble across a picture of someone doing taijiquan, it's either single whip or - or it's brush knee. So I thought it might be useful to run through the ubiquitous brush knee and show some of the varied applications - running from those that people most often use to those that might be more obtuse and even seem "inventive" (but which, I'm sure you'll agree, actually follow the literal form of the technique). The first, and I think most common, interpretation of brush knee is a deflection against a front kick. It certainly does work for that. In so doing, it uses taiji's "continuing momentum" of which I've previously written. Notice how I draw my own weight back to "absorb" Jeff's force into a near "vacuum" where I can easily deflect the last contact, then use my coiled momentum to spring back. Of course, most folks "in the street" don't really do or know front kick. If they kick, they tend to kick with a low roundhouse. Unless you're a sports fighter, the attack you're likely to face in a civilian context will be in the melee range. In that range a shin kick to your thigh is easily jammed with brush knee by pressing and redirecting your attacker's thigh. Again, there's the same deal with the "coiled energy" counter. Then there's the more inventive uses of brush knee - in this case, against a higher roundhouse (or other kick) that you manage to catch. Note that my hands in this case actually follow the literal form of the "brush knee" sequence. Importantly, I don't let Rob turn around and slip out; I use the "block" (together with a side evasion) to stop any "rollover", then bring him down with the "push" part of the sequence. Note my use of the forearm rather than the palm! On the other hand, nothing stops me from using the palm as a face strike too - especially when the kick is higher. As I explain in the video, there are probably a dozen things I'd rather do than block a high roundhouse kick this way, but hey, it can happen: I might have to do it. In that case, why not shove your free palm straight into your attacker's face? But here's where I think the brush knee really shines. And quite frankly, I suspect it is the very last thing on people's minds when it comes to applications of this move. Taijiquan is for me an "anti-grappling" art. You don't want to be caught up in a clinch. Note how my literal form collapses Rob's grip with my arm, draws back to centre line and under his leg (with my elbow dropping onto the top of his thigh as he kicks) and allows me to break his structure when I "uncoil" the momentum, using that palm to drive forwards. But then there's always the "non-kick" and "non-grappling" applications. Nothing wrong there. For whatever reason, Jeff and I swapped legs here, but you get the idea. The video shows the effectiveness of this technique against a more determined, penetrating thrust/push/punch. Essentially you can set this up as a "rolling push hands" drill. And last, but not least, there is no good reason not to think of the "downward block" as quite a useful deflection even for a chest/head height attack! Crazy, I know - but the video explains it. If your arms are up already, then a high level punch can be stifled from above quite effectively. I have my good friend Colin Wee to thank for this particular realisation. Of course there are many other applications - I have yet to do a qin-na demonstration (although the clinch comes into that). Consider my knife defence article featuring brush knee as just one other example!